France's Sebastien Loeb successfully defended his World Rally Championship title after finishing second in the Rally of Japan behind Marcus Gronholm. The Citroen driver needed a podium finish in the 13th of the 16 rounds to retain his crown. Loeb's eight rally wins so far this season is already a record, beating his six victories last year. Norway's Petter Solberg, in a Subaru, had led until the 24th stage but hit a rock in the penultimate stage. Australian Chris Atkinson finished in third place. 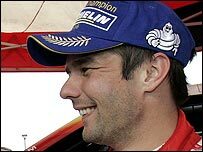 Loeb is the second Frenchman to have won the world title after Didier Auriol, the 1994 champion. He is the fourth man to retain the title after Finns Juha Kankkunen (1986/87) and Tommi Makinen (1996/99) and Italian Massimo Biasion (1988/89). "To be honest, it didn't matter if I was first, second or third in this rally - I just wanted to win the championship," said Loeb. "I didn't want to get involved in the battle with Petter and Marcus because I would have been very annoyed with myself if I'd gone off as a result of me chasing them and then making a mistake." Solberg was sorely disappointed to miss out on his first victory since Mexico in March, but said he had no choice but to retire after damaging his suspension. "We could do nothing to avoid the rock, it was right in the line," he said. "It happened so fast and that was that. I'm absolutely gutted. There's nothing more to say."